This entry was posted in #geoblog, More Views and tagged Arkansas, Bryozoan, Cool Pics, Coral, Fossil, Tabulate coral on April 14, 2017 by argeology. Pictured is the remains of an animal, called an Archimedes, that flourished in Arkansas about 350 million years ago. At that time, Arkansas was covered by a warm tropical sea, and invertebrate organisms such as Archimedes lived by straining tiny food particles from the sea water. Though similar filter-feeders exist today, this particular one is extinct. 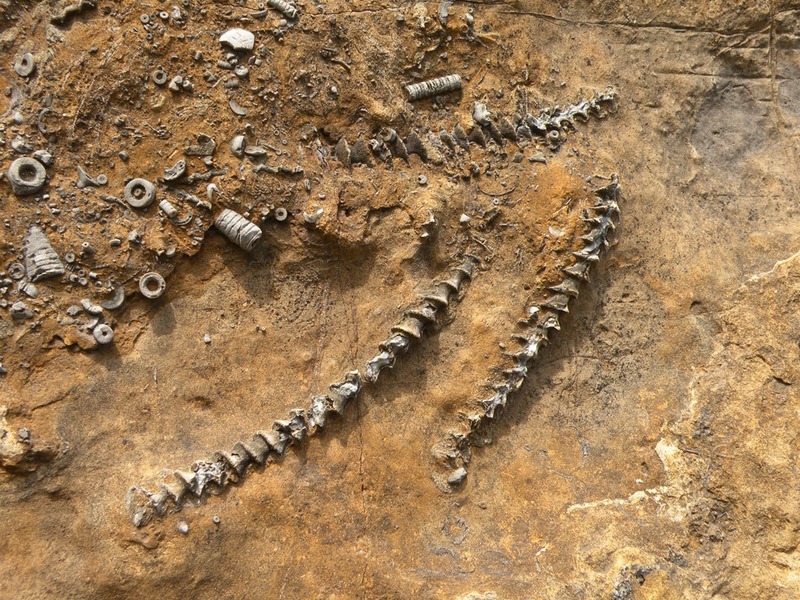 In this photo, we see a cross section of the animal; the screw-like pillar supported it from the center and delicate, barely visible lattices whorled around the screw – in cross section they look like ribs of a fish bone (see picture). Those were the filters the animal used to trap food. 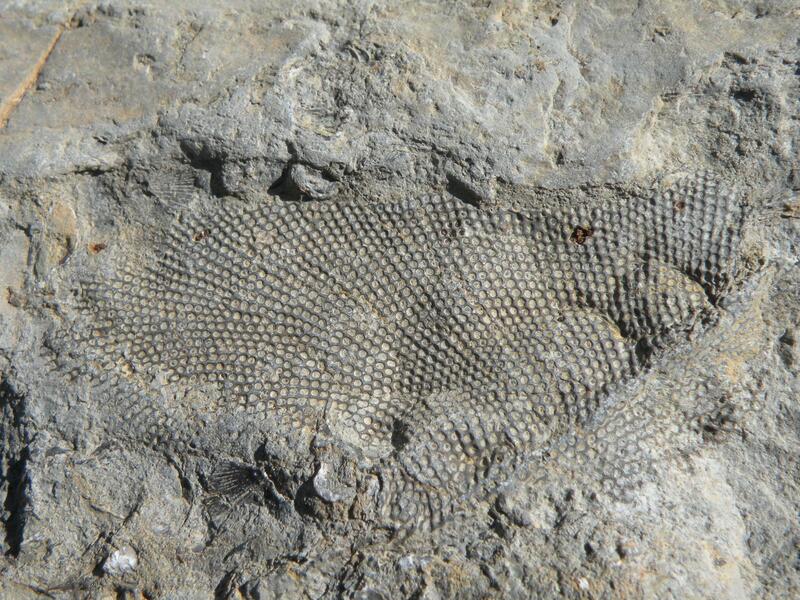 Because the lattices were brittle, they were rarely preserved with the fossil, which makes this specimen exceptional. The limestone pictured is from the Pitkin Formation in northern Arkansas. 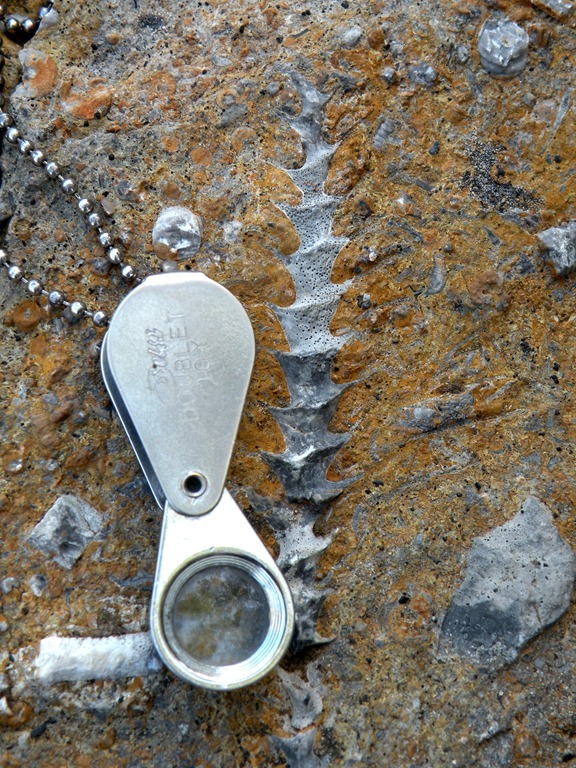 This entry was posted in #geoblog, GeoPic of the Week and tagged archimedes screw, Arkansas, Bryozoan, Fossil, limestone, Pitkin Formation on August 3, 2015 by argeology. This is a picture of weathered fossiliferous limestone of the Pitkin Formation. It was taken in a quarry near Batesville Arkansas. The picture displays fossil remains of two common aquatic animals that lived in the shallow sea covering northern Arkansas between 360 – 320 million years ago. The screw-shaped remains are parts of bryzoans; they are commonly referred to as Archimedes screws. The nut-shaped fossils- which also resemble rolls of smarties candies- are the remains of crinoids, commonly called sea-lilies, which have living relatives in the ocean today. Both animals lived by attaching themselves to the sea floor and filtering food, such as plankton, from the ocean water. 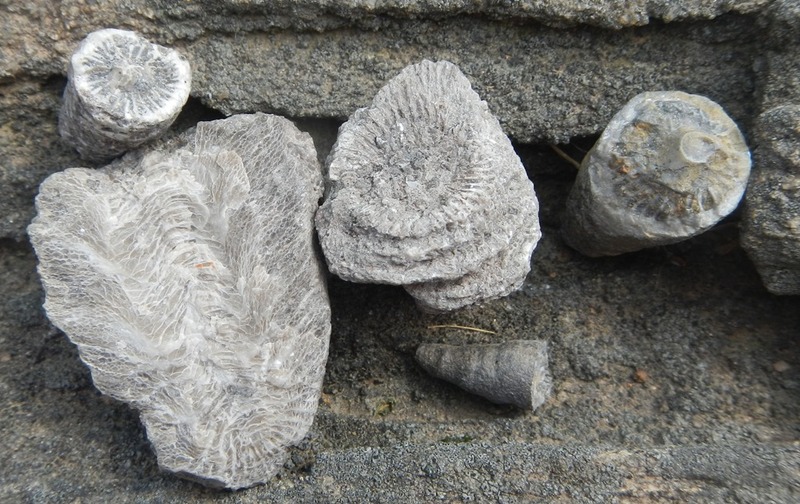 This entry was posted in #geoblog, GeoPic of the Week, Sedimentary Features and tagged Bryozoan, crinoid, Fossil, invertibrate, limestone, Mississippian, Pitkin Formation on February 2, 2015 by argeology. Bryozoans are colonies of tiny individuals, approximately a millimeter or less, living from tide-level to abyssal depths in today’s oceans. They have been abundant and diverse throughout geologic time since the Ordovician Period. Bryozoan colonies vary in shape and can be stick-like, massive, or lacy and net-like. Lacy bryozoans are also called fenestrate bryozoans. 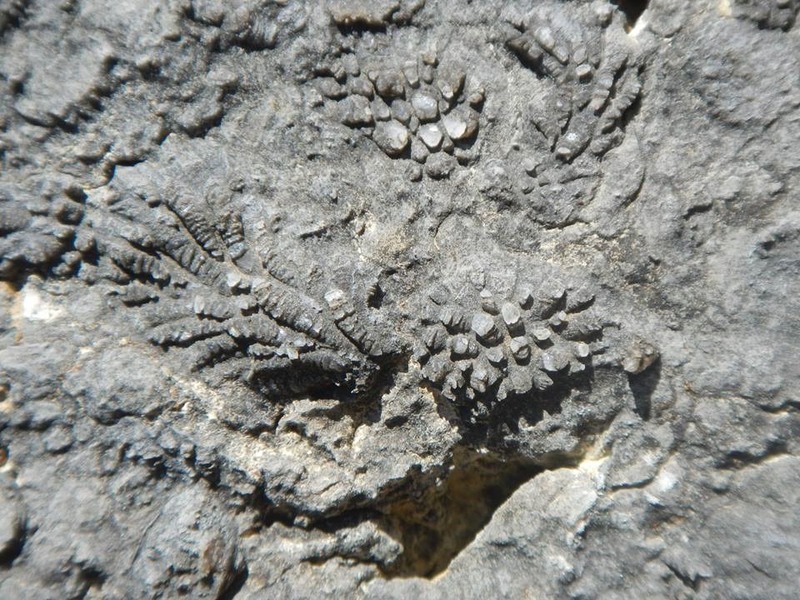 The lacy bryozoan in the picture is approximately 2 inches (5 cm) long and is present in Pennsylvanian age rocks in northwest Arkansas. 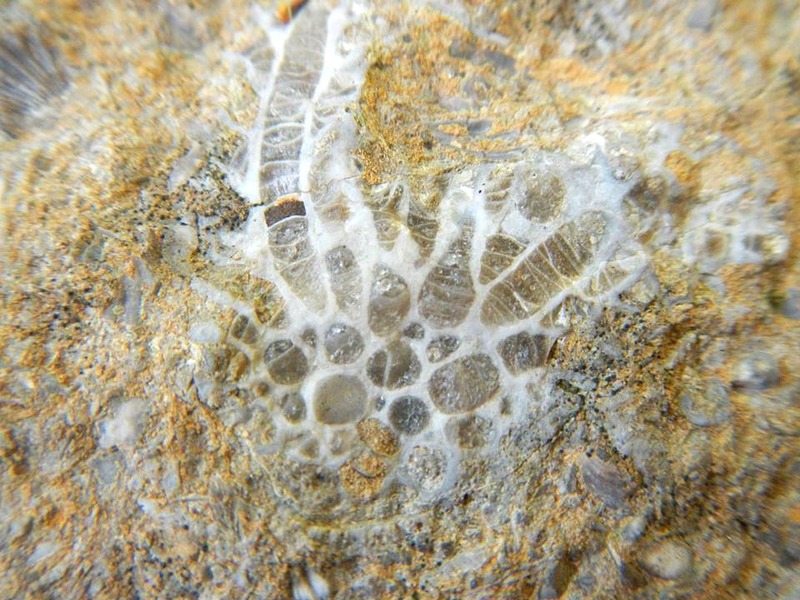 This entry was posted in GeoPic of the Week and tagged Bryozoan, Fossil, Ordovician, Pennsylvanian on February 7, 2014 by argeology.